Last night I watched a film that blew my mind. It blew my mind visually, aurally and mentally. 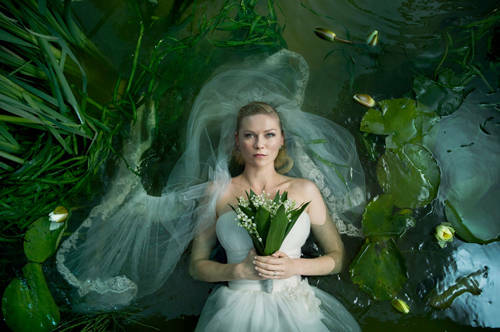 Melancholia is by far the most affecting film I have seen in years. In fact, in the metaphorical post orgasmic glow I can't actually think of another film that filled me with such tension, awe, pain, sadness and a weird sort of vindication. Von Trier courted controversy with his pro-Nazi comments at Cannes this year. But it appears he either did that for effect, or it was a ill-judged joke, or... actually I don't care. I think he's probably socially awkward and cocked up something that was meant to be a commentary on something or other. It's a shame, though, that this may have coloured peoples' opinions of him to the extent that they may not ever watch this film. As a sufferer for many years, I have never seen in a film a depiction of the depths of hopelessness and nihilistic drag the canker of depression can cast over a person's life. After a sublime and beautiful opening sequence which features a series of apocalyptic vignettes set to a pulsing Wagner (nope, steer away from the Nazi connection please...) score we already know without question that the world is going to end. We then join Kirsten Dunst's character, Justine, on her way to her wedding reception. Her charmed life and the love from her new husband radiates in her smile. She looks beautiful. Perfect. Happy. Smiling. We reach an enormous mansion that turns out to be the home of Claire and her family. Claire is Justine's sister and appears uptight, bossy, control freaky and mean. Von Trier first tells Justine's story by allowing her to unravel before our eyes. Before the wedding night is over it is clear Justine is suffering from severe and debilitating depression. "I thought I could do it," she says, speaking of her relationship, her wedding, her life. Claire is angry. Claire's husband, a scientist who also happens to be Kiefer Sutherland in a rare non CIA role, is even angrier. "I tried," says Justine plaintively to Claire. "I smile and I smile and I smile." Her mask isn't enough and her true self leaks through, slowly poisoning the traditions and fakeries of her own wedding reception. A reception that includes Justine disappearing on numerous occasions. She escapes onto the golf course, of which her brother-in-law is so proud, and alternately pees while staring at the constellation abover her and shags a stranger following a scene where her husband awkwardly paws at her as she stiffens and finally runs away. The marriage is over before it has begun and she says goodbye to her husband. A failed attempt to communicate with her supremely selfish parents renders Justine absolutely alone with only the darkness inside her. Alone, that is, except for Claire. Claire is her reproachful but ever present support. "Is everyone in your family crazy?" snaps Kiefer. "She's my sister," she answers. Justine lives without hope and without hope there is no future. Which is why, when it becomes apparent that a planet called Melancholia is hurtling towards earth and may possibly collide with it, therefore rendering life obsolete, Justine is calm and unafraid. She is not frightened of the obliteration of mankind as, to her, life on earth is evil. Claire is the pillar of support that helps Justine function through the catatonic stage of depression that follows the wedding. Justine can barely walk. She cannot wash herself. She cannot eat. Claire holds her up next to a bath, baby talking her into stepping into the water. Justine folds in on herself, wailing like a child. She has regressed to a state where she no longer has to cope with the darkness around her. Sleep is her little death and Claire keeps her alive through that. In the second part of the film we switch to Claire. It becomes clear that calm, rational, capable Claire is chronically anxious, possibly self-medicating and really freaking worried about the planet that is on its way. Her scientist husband reassures her over and over that there is no danger. As we already know that this isn't true, the tension ramps up slowly, slowly, slowly. Justine is now a calm presence in the background of Claire's increasing panic. The day finally arrives and we sit with the family as they watch the planet come closer and closer. It seems inevitable that this is the moment. But the night passes and the planet appears to recede. And as inexorably as Justine's darkness encroaches on her potential future, the shadow falls over the earth again as Melancholia comes closer. Claire's husband commits the ultimate betrayal when he realises his calculations were incorrect. While Claire is dozing in the sun he takes all of the tablets she had stockpiled and kills himself, leaving Claire alone to face the end of the world. Alone, that is, apart from Justine. So Justine, Claire and Claire's sun face the end of the world together and the final scene ratchets up the tension unbearably. The planet hits, the screen fades to black and then it's finished. And I'm quietly hysterical on the sofa. Snot, tears, the works. As I was at someone else's house this was a tad embarrassing. I googled reactions to the film and they are almost a 50/50 split between 'it's really boring and miserable' to 'it changed my life'. I urge you to watch it and decide for yourself.